General Motors is certainly taking some bold moves with their 2013 models and the recent introduction of the 2013 Chevrolet Spark is another step in the right direction. The Chevrolet Spark is based on the South Korean platform of the Daewoo Matiz model which has already proven to be a potent sales success in other parts of the world. Having the opportunity to drive the Spark over a one week period, we can honestly say, if we were in the market for a small, fun, economical vehicle this would be at the top of our list. We were pleasantly surprised how much fun we ended up having behind the wheel of little “Sparky”, an endearing name my wife came up with which suits the car’s personality perfectly. The combination of compliments from teenagers, its peppy performance and the utter jubilation of filling the gas tank at a price I can only remember from my high school days, there is a so much to love about this car. 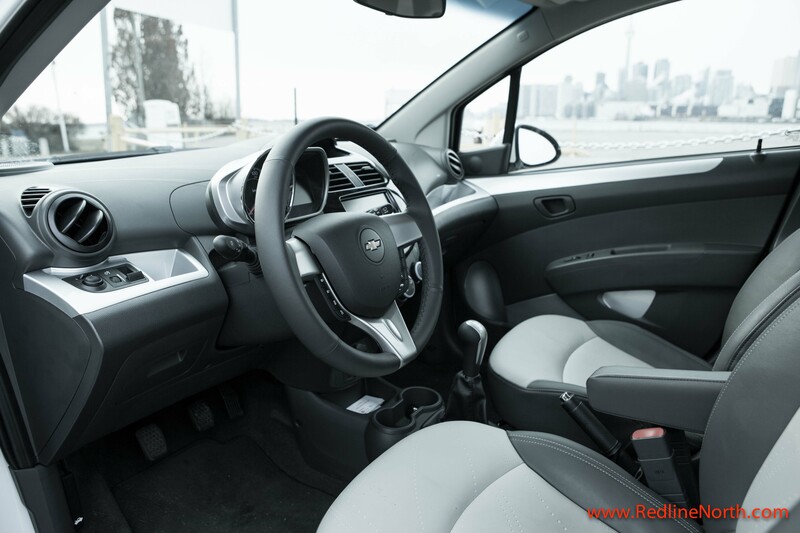 We drove in both city and highway environments and the Spark passed all the usual tests with flying colours while being ultra convenient for parking and large enough to grab a few groceries in between. All the while, we averaged 6.5L/100KMs (36 MPG US) which is very solid fuel efficiency for a combined city and highway driving experience. 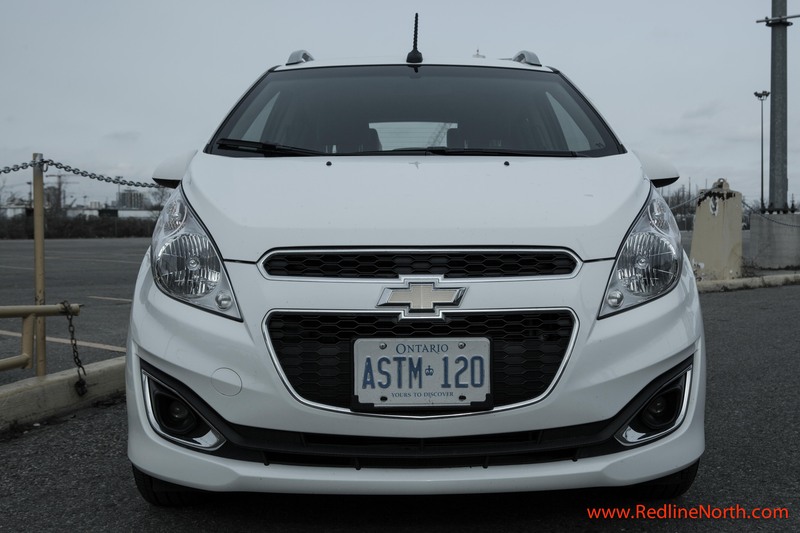 As for things we did not like, similar to the 2013 Chevrolet Sonic, the passenger seat is missing an armrest which can be aggravating on a long trip. As well, the steering wheel column is poorly designed since it is attached to the gauges as all one piece, this results in the steering wheel blocking the top of the speedometer from view. However, aside from those two things, the Spark performed amazingly well, and was fun to drive around town. The interior is solid for an entry level car and competes with anything on the market today. Of course, saying that, you get what you pay for as our tester was the top of the line model. Chevrolet MyLink TouchTM – AM/FM stereo, 6 speakers, seek-and-scan, digital clock, 7″ diagonal colour touch-screen, Bluetooth streaming audio for music and select phones, Stitcher smartphone compatible, cruise control, steering wheel controls, software updatable for radio software and 1 USB/iPod/MP3 input jack located in front centre stack storage bin. 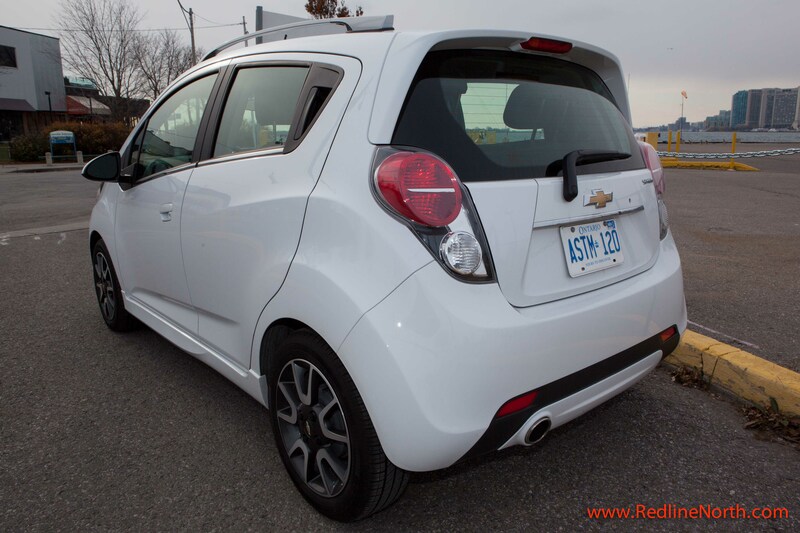 GM has recently announced they will be producing an electric version of the Spark as a 2014 model in selected markets. The electrified version of the Spark will have a whopping 400lbs of torque and will do zero-to-60 mph in less than eight seconds. We can’t wait to get behind the wheel to see how it compares to its internal combustion engine sibling. The micro or subcompact segment is growing fast as many manufactures now offer models in the category. The key players currently competing with the Chevrolet Spark for buyers here in Canada include the Ford Fiesta, Mazda2, Fiat 500, Smart fortwo, Toyota Yaris and Hyundai Accent. 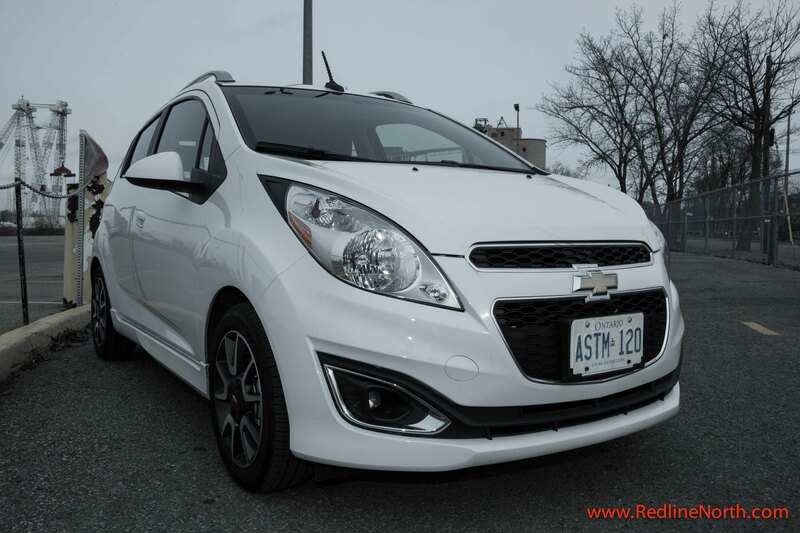 This entry was posted in Review and tagged 2013 Chevrolet Spark, Daewoo Matiz, Fiat 500, ford fiesta, GM Canada, Hyundai Accent, Mazda2, Smart fortwo, Toyota Yaris by northredline. Bookmark the permalink. A long, long time ago we raced IHRA and NHRA Super Street, Gas and Comp. It was a family thing. Never went quite this fast thgouh Those days are gone, and now I’m a spectaor. So,when I want to seriously pull those wonderful memories back from the past, I watch your video 3 or 4 times and I’m there!. Thank you for helping me to relive some great times!